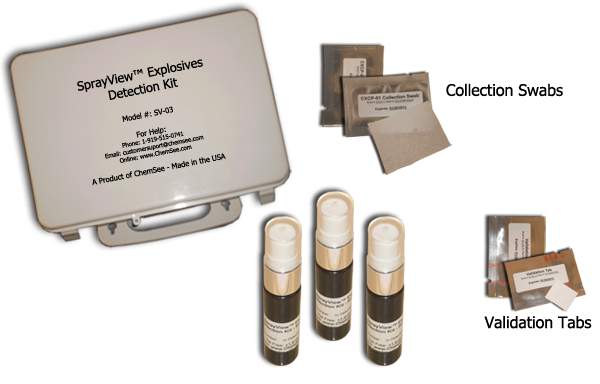 ChemSee’s portable SprayView™ Explosives Detection Kit uses well established and reliable chemistry to detect Organic and Inorganic nitrate explosives using small convenient spray bottles. 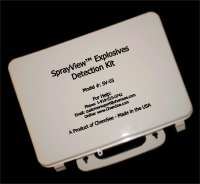 The SprayView™ Detection Kit forms a bright visible color when the target explosive is present. They are simple to use, even for unskilled personnel. The SprayView™ Detection Kit’s small size (8x5x3in) and weight (450g) makes this portable detection kit ideal for use in investigative teams or for personnel working in the field. Cleansing Solution – Removes Detection Residues from Spray Bottles in order to maintain them. Avoid spraying detection solutions on the eyes, skin and other body parts. Each portable detection kit contains all the necessary items to conduct 25 tests in the field without the need of any additional supplies. Each portable detection kit contains all the necessary items to conduct 50 tests in the field without the need of any additional supplies. 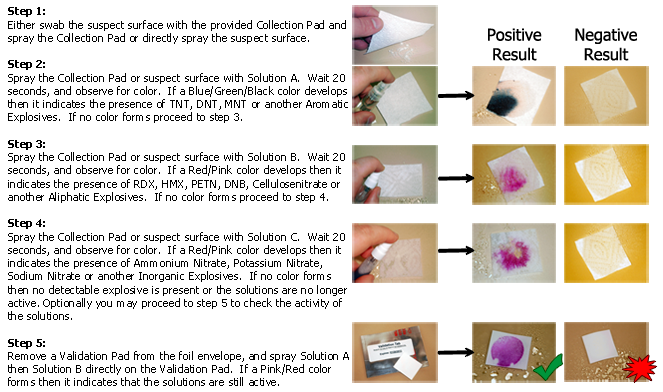 Each portable detection kit contains all the necessary items to conduct 100 tests in the field without the need of any additional supplies.